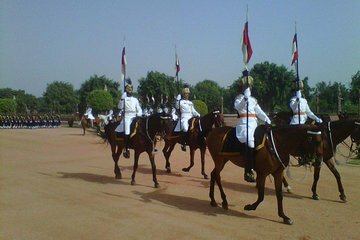 We could not attend the changing of the guard owing to security restrictions before the Republic Day Parade but went to The National Museum in its place. That museum is absolutely wonderful and is close to central New Delhi. We also attended The National Rail Museum as planned in the morning and had a marvellous time there which included a trip in a quaint toy train around the fascinating old railway engines and carriages - many were classic very large steam engines - many beautifully dressed and well behaved school children were on the little train. The rail museum is a must for children to visit! There is also an indoor museum, which is beautifully set up, and also a fascinating souvenir shop with everything a child or a railways buff could ever wish for and purchase. Our guide was wonderful. Excellent. Not a large crowd. I recommend standing at the back rather than sitting in the allocated chairs.